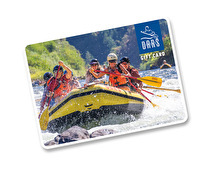 Perfect for holiday, birthday, wedding, graduation or any other special occasion; OARS gift cards may be redeemed toward more than 100 professionally-guided rafting, hiking, sea kayaking and multi-sport adventures in the U.S. West and internationally. Reservations required. Gift must be submitted as payment at the time of booking. Departures subject to availability. Standard OARS booking conditions apply. Deposit is required to reserve space on any departure. Applicable taxes & fees required at time of booking. Not redeemable for cash. If the trip cost exceeds Gift Card amount, remainder may be paid for with cash, check or credit card* Participants must sign a liability release. For balance inquiries call the phone number to a OARS Whitewater Rafting's location below.